Bake 'ulu at 350 degrees F for approximately 2 hours (make 3 -4 incisions about 2 inches long to prevent 'ulu from expanding). Remove skin of cooled 'ulu and cut in half. Core and cut into 1/2 inch cubes. Cut cucumber lengthwise into 4 slices, then chop into 1/2 inch cubes. Cut 2 medium tomatoes and avocado in 1/2 inch cubes. Squeeze juice of the Tahitian or island limes into small cup and set aside. Chop finely 1/2 bunch of Chinese parsley and slice 1/2 the Maui onion in very fine slices. Mix all ingredients gently in a large glass bowl and add the Kona salt and pepper. Drizzle with the organic olive oil and lime juice to desired taste. In a mixing bowl mix coconut cream, sugar and Herbes de Provence. 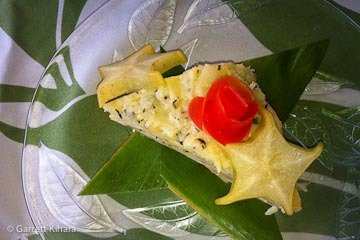 With a mandolin slice 'ulu into thin slices. Fold cream coconut mixture in to the sliced 'ulu. Line a 12 x 15 inch baking pan with parchment paper. Place 'ulu slices in an overlapping line filling the bottom of the pan. Sprinkle 1/3 of a cup of Parmesan cheese on top of 'ulu slices. Repeat layers of overlapping 'ulu and sprinkling of cheese. You should be able to make 4 layers. On top of the last layer add the remaining Parmesan cheese. Cover pan tightly with aluminum foil then bake for 45 minutes to an hour. Let sit for about 10 minutes to cool down a little. Cut and serve. 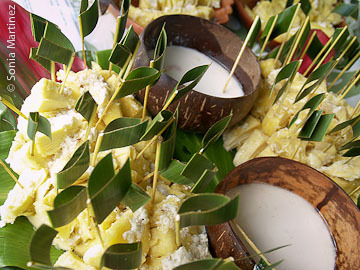 Ric Rocker's 'Ulu Cooked in Real Coconut Milk. Peel and core 'ulu and cut into 8ths. Steam until 85% cooked. Take water from steamer and mix 50/50 with cold water to use for making the coconut milk. First squeeze very little water and put aside for dipping sauce. Take 'ulu from steaming tray and put into a sturdy pot. Add coconut milk (squeeze 2-3 times) enough to cover the 'ulu half way. Cook with lid askew until water in coconut milk evaporates leaving clear coconut oil on the bottom of the pot. Cook until bottom layer is 'fried' in the coconut oil and turns brown. Add chile peppers to coconut cream and smash until coconut cream turns pink. Add lime and chopped green onions. Boil 'ulu until knife will penetrate (45 minutes to 1 hour). Cut in half, remove core. Cool at room temperature, peel and cut into 1 inch squares. Combine 'ulu, ginger, garlic chives, pepper, amino acid and canola oil in covered pan. Stir often until 'ulu and ginger become toasty-golden. Keep at medium heat to avoid burning. 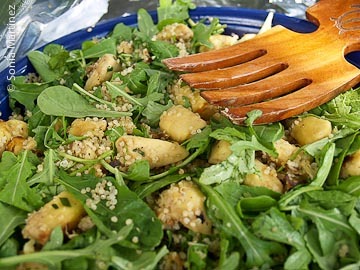 NOTES: Gingered 'ulu salad for dinner is great with grilled fish and makes a great lunch on its own.